One of many trailer shots in the movie. Despite that, I went in with a blank slate. Get On Up started, in typical musician biopic fashion, in the 1980s, when James Brown (played by Chadwick Boseman) was a bit past his prime and in the middle of a drug-induced meltdown as he brandishes a shotgun, pointing it at the workers of a company who rented out an office he owned. The movie then jumped around a bit at different points in his career before finally starting at the beginning, when he was a poverty-stricken boy in pre-World War II Georgia. Get On Up made a sincere effort to be an honest telling of James Brown’s life. The movie made absolutely no attempt to gloss over Brown’s less-than-savory personality traits, namely his ineptitude as a businessman, his penchant for domestic violence, and his ego. We see James Brown first struggling against the times in order to get himself to stardom, and then he found himself struggling against himself to maintain it. I was absolutely awestruck by Chadwick Boseman’s portrayal of the musician. While I didn’t know very much about James Brown prior to seeing this movie, I had no trouble believing I was watching James Brown onscreen, and that was partly thanks to the makeup used to age Chadwick Boseman to the appropriate time, whether James Brown was in his teens or well into his 40s. Boseman was supported by a great supporting ensemble as well. I particularly liked Dan Aykroyd as manager Ben Bart. Get On Up was in general one of the most well-acted movies I’ve seen in a while. At that point, the movie brings us into a flashback where we see James Brown as a boy blindfolded and put into a boxing match with other similarly blindfolded boys for the entertainment of white people. James Brown gets knocked down. As he was on the ring’s floor, he lifts up his blindfold to see the black band playing. Then the band gets up and starts dancing while suddenly playing funk music. I know this scene was supposed to be symbolic of something. I’ll be damned if I can tell you what it was. At that point in the movie, I thought it was officially trying too hard. Get On Up for the most part did a great job of being an entertaining and informative picture without being manipulative, but it lapsed into manipulation at certain instances. Considering director Tate Taylor was known for making 2011’s The Help, which is the very definition of a manipulative movie, I guess I shouldn’t be surprised that he wound up making decisions which would not really have been appropriate for a biopic of James Brown. 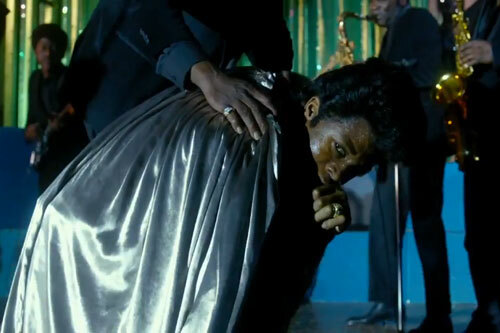 Overall, despite not being a fan of James Brown, I still felt like I got a lot out of Get On Up. Needless to say, you will hear some great music. While it’s too early to say, I’m sure many cast members in this movie will be getting Oscar (even though I don’t really take the Oscars seriously anymore after Frozen won Best Animated Feature over The Wind Rises) nominations for their acting. I lay all the faults I had with the movie in Tate Taylor’s lap. While the movie was about James Brown’s ego, I got a nice dose of Taylor’s ego as well.